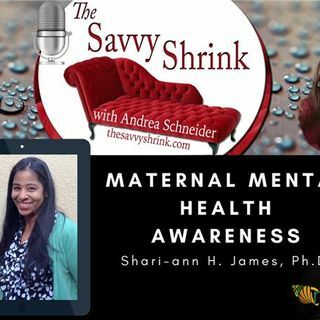 Maternal Mental Health Awareness with Shari-ann H. James, Ph.D.
Join the host of The Savvy Shrink, Andrea Schneider MSW, LCSW, as she interviews Shari-ann H. James, Ph.D. Dr. James is a licensed psychologist with over 15 years of experience. Her psychotherapy practice focuses on women, with a special emphasis on reproductive and perinatal motherhood (e.g. perinatal mood and anxiety disorders and issues related to infertility, perinatal loss, trauma, pregnancy, and childbirth). She focuses on creating positive transitions to parenthood through healthy ... Más informaciones martial/partner relationships and parent-baby attachments. She also provides consultations and trainings on the subject of perinatal mental health within her community. On a national level, she presents at conferences on the emotional complications during the perinatal period. Dr. James is the founder of the Central Florida Postpartum Alliance, which strives to raise awareness, provide support, resources, and treatment referrals to those impacted by Perinatal Mood and Anxiety Disorders. In addition, she hosts the wellness pod podcast which focuses on reproductive and maternal mental health and women's wellness.